Bridport Cohousing is now ready to start offering homes FOR SALE off plan. Click here to go to our MICROSITE which deals specifically with Bridport Cohousing Sales and Rentals, and over time will show which homes are reserved and, later, sold. Please note that our RENTAL HOMES will become available during the course of the build process – we’ll flag them up as soon as they are made available through the Dorset Home Choice website. Our homes are generally all designed to the same specification, so the information on homes for sale will also apply to the homes that will be rented. A SPECIFICATIONS BROCHURE is being prepared and will be posted here as soon as it is ready. 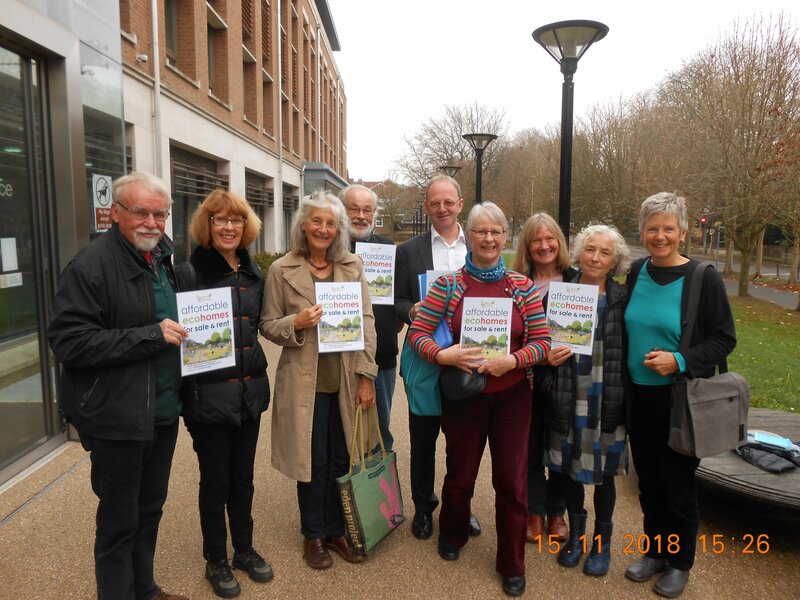 One of the final hurdles we have had to negotiate before we can start work on site took place on Thursday 15th November 2018 at the offices in Dorchester of The Dorset Councils Partnership (of which West Dorset District Council is now a partner), where members gathered to hear the outcome of the Phase 2 Planning Application that had been first put in place May 2017. Much work had been done to simplify a previous application which included an element of self build, and had addressed the concerns of Allington Parish Council around car parking and flooding risks. There were some anxious moments for us when the Committee asked for clarification around the wording of the permission and why we were only being asked to build 7 affordable homes but had applied to build 19. It took some time to establish what members of the Committee were being asked to agree to. Happily, however, we had our professional advisor, Charles Couzens in the room to bring calm clarity to their objections, which resulted in unanimous approval for the application. The good news is that we can now proceed with the whole development of 53 affordable houses in one step, which will have positive implications for saving us both time and money. • are working towards the building of phase 1. Our professional advisors are Charles Couzens of Ecos Maclean Ltd, a sustainable engineering consultancy based in London and Somerset; and Alan Heeks, who founded and co-led the creation of the Threshold Cohousing Centre in North Dorset, the first mixed-tenure cohousing scheme in the UK, in partnership with Synergy Housing. Our architects are Sam Goss and colleagues at Barefoot Architects.